This year, I learned how to drink from a marketing firehose. In January, I took on the role of Vice President of Marketing for IMPACT, and with it, assumed management of a six-person team and ownership of the company’s marketing objectives. This was brand new to the organization, and prior to January, the team didn’t really exist. Instead, we had a couple of fantastic marketers who worked directly with the company’s founder and CEO to carry out his vision. This approach worked well in IMPACT’s early years, and took the company from scrappy startup to the 50-person agency named HubSpot’s North American Partner Agency of the Year in 2017. However, like most growing companies, what got us from zero to 50 is not what will take us to the next level. IMPACT is a fast growing company with an aggressive, agile mindset, and ambitious marketing goals. We aim for extraordinary growth rather than steady growth in our key metrics, and achieving that requires a strong focus on data and the ability to learn - and adjust course - quickly. TL;DR: Our marketing team has a LOT going on and tracking, analyzing, and reporting our performance across all of the different marketing platforms we use would be a bear if it wasn’t for our Databox marketing dashboards. 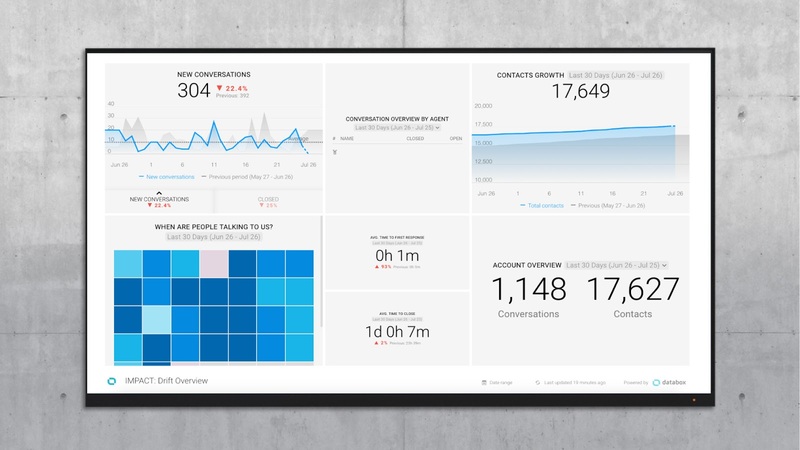 Read on for details of exactly what we track and how our dashboards are structured. Like many businesses, IMPACT sets and tracks goals on a quarterly basis. We start with a three-year vision for the business as a whole, and then break that down into one year with quarterly business objectives we use to determine what our marketing team needs to actually do. About a month before the quarter begins, we meet as a team to identify marketing OKRs or objectives (the outcomes we are trying to achieve) and key results (the measurable milestones that serve as leading indicators of whether we’re on track to hit our targets). Sometimes these OKRs stay consistent from quarter to quarter. For example, website traffic (sessions) is one of our most important OKRs, and each quarter the goal (total number of sessions) increases. Other times, we introduce completely new ones. For example, in the second quarter of 2018, one of our key objectives was to bring IMPACT into GDPR compliance. That was a one time effort that was of high strategic importance to the business, and now that it has been accomplished, we can turn our attention to other things. My job, as IMPACT’s VP of Marketing, is to ensure we hit all of these marketing OKRs and to do that, I need to closely track our progress and ensure the team is adjusting course quickly if we look to be off track. At any given moment, IMPACT’s marketing team has its hands in a number of initiatives in an effort to achieve our OKRs. From lead generation campaigns to community building, video marketing, events, and brand awareness, we’re always juggling. Because of this, tracking and reporting on the effectiveness of our efforts is not as simple as it might seem. I’m fortunate that, through IMPACT, my team has access to a number of cutting edge marketing platforms such as HubSpot, Google Analytics, SEMRush, Lucky Orange, Facebook, LinkedIn, Twitter, YouTube, Vidyard, Drift, and more. Each of these tools serves an important purpose and helps us more effectively execute IMPACT’s marketing, but it can be incredibly time-consuming to log into each one of them on a daily basis to check performance - time that I and the members of my team simply don’t have. Even if it wasn’t a total pain in the you-know-what to cobble together marketing reports through the various platforms, I still wouldn’t want my team spending so much of their time on reporting when it is better dedicated to actually doing our marketing. This is where dashboards can be so helpful. 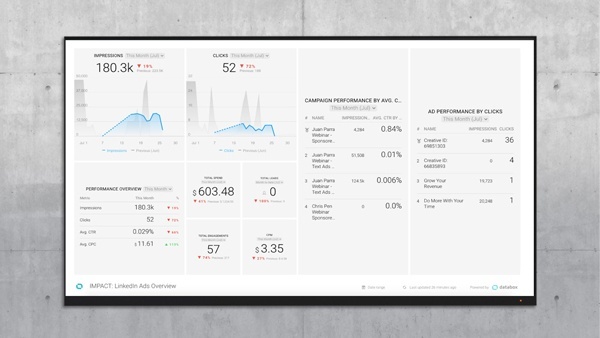 Not only do marketing dashboards provide a quick snapshot of where we stand in relation to our OKRs, they enable me to assess, on a daily basis, whether we are making progress AND provide me and my team an opportunity to take proactive action if it looks like we’re not going to hit the target. Because we have quite a few goals - and I need to understand not only whether we’re on track to hit our top-level OKRs, but also why or why not - one dashboard simply doesn’t cut the mustard. I also need to satisfy multiple audiences with the marketing dashboards I’ve created. Some are purely for me, but some are for my team, and others are for the company’s leadership. That’s why I use Databox. 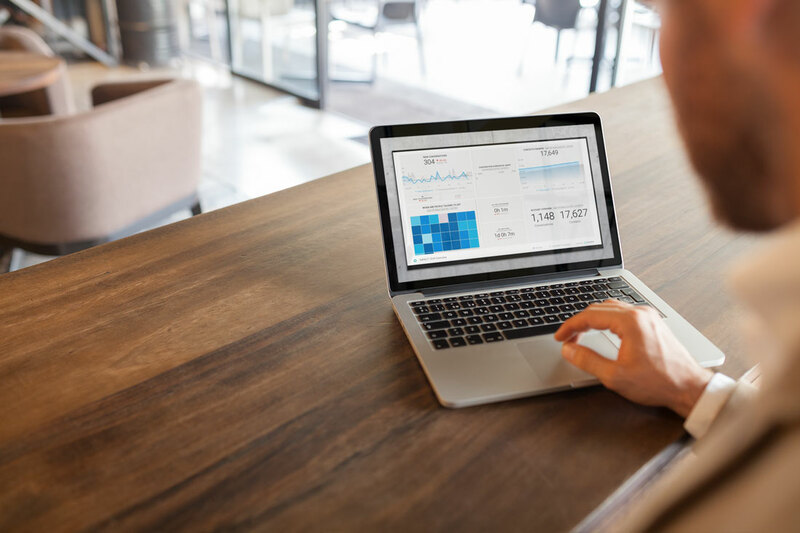 Databox is designed specifically for marketers and has out-of-the-box integrations with most of the third-party software platforms that IMPACT uses. Full disclosure, we are a Databox partner agency as well and use it for all of our clients, but that’s with good reason. Below I’ve shared just some of the dashboards I’ve created in Databox to track IMPACT’s performance. The most important marketing dashboard I have -- and the one that is bookmarked in my browser and kept open at all times -- is the Brand Team “Top-line Objectives” dashboard. This is the single source of truth for the most important, top-level metrics I need to track every day. It is shared with IMPACT’s CEO and COO, and is what I pull up in monthly leadership team meetings as well as weekly meetings with my team. Download our Top-Line Objectives template here for free from Databox. 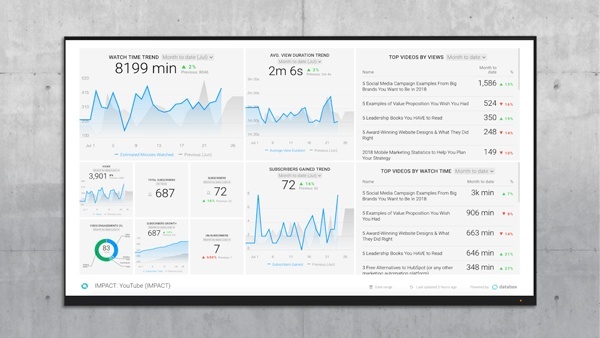 This dashboard combines data from multiple sources -- HubSpot, YouTube, etc. -- and has helpful text summarizing the team’s goals for the quarter, as well as indicators of how we’re tracking against those goals. This is really helpful when someone outside of our team looks at it and needs a quick reminder of what we’re tracking and why. It includes metrics like total registered participants for each of our webinars (tracked via smart lists in HubSpot and pulled into Databox using their HubSpot Marketing Query Builder), monthly website visitor sessions, average pages per session, total YouTube watch time, and YouTube subscribers. In addition to my bookmark, I also set up a daily notification email along with special alerts that notify me when we have met our targets as well as any time it looks like we are off track and will not meet them. This is a great additional feature of Databox. Email is an incredibly important channel for IMPACT. We have a large contact database of over 120,000 subscribers and send a great deal of emails, from daily/weekly/monthly blog digests, to podcast subscriber updates, webinar promotions, and bi-weekly updates about our Facebook Group, IMPACT Elite. Because of this, we are very careful about how often and to whom we send email. We do a lot of testing, including that of subject lines, sender names, body copy, and experimenting with different email formats (from highly-designed to stripped down, plain HTML) and send times. I watch closely to see how all of these different variables (volume of emails sent, copy, email format, etc.) impact our deliverability, open rates, click-through rates, and contacts lost. I’m able to keep track of it all through my email performance dashboard. 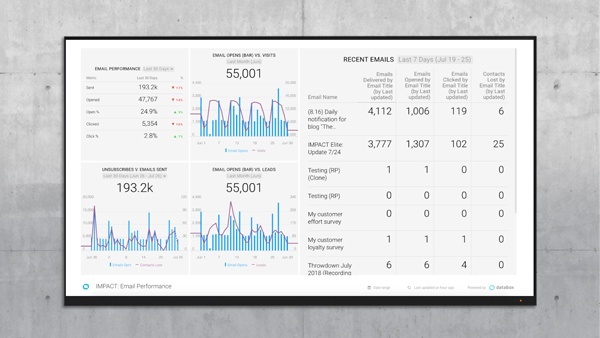 Download our Email Performance template here for free from Databox. The performance of individual emails we’re sending. The data comes directly from HubSpot and is a tremendous time saver because, while all of this information is readily available in our HubSpot portal, it would be incredibly time consuming if I had to track it down on a daily basis. I also have a separate dashboard that helps me keep a close eye on audience email fatigue — what occurs when subscribers aren’t opening our emails or (even worse) are sending them to spam. Download our SeventhSense Email Marketing Fatigue template here for free from Databox. Email fatigue generally occurs when you are either sending your audience too many emails or they feel the content in the emails you’re sending isn’t relevant to them. We use a tool called Seventh Sense in conjunction with HubSpot to track audience email fatigue through a Databox dashboard. Seventh Sense, which is an email send time optimization platform, uses artificial intelligence to evaluate the data in our existing HubSpot instance and determine the best time to send email to each individual contact in our database. It also evaluates whether and to what degree those individual contacts are opening our emails, categorizing them as low, medium, high, or very high fatigue based on that data. 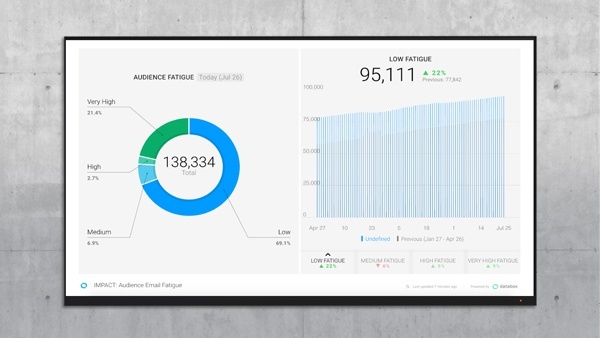 Our goal is to maximize the percentage of our audience in the low fatigue category, so understanding how this data is changing over time is crucial. The dashboard shows an overall breakdown (via pie chart) of our audience by level of fatigue, as well as specific bar charts showing how each category (low, medium, high, and very high) has changed over the last 90 days as compared to the previous 90 days. IMPACT has made a major push into video over the course of the last year. We now have three YouTube channels and a growing in-house video team dedicated to not only creating world-class videos for IMPACT, but also teaching other businesses how to best use video in their marketing. I have four individual YouTube dashboards that I review regularly, but the most important is the YouTube Channel Overview. 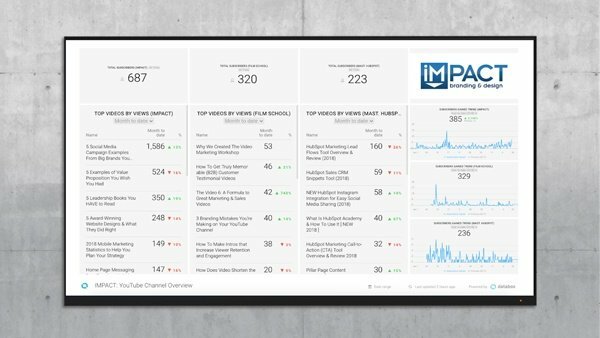 Download our free YouTube Multi-Channel Performance Databox template here. 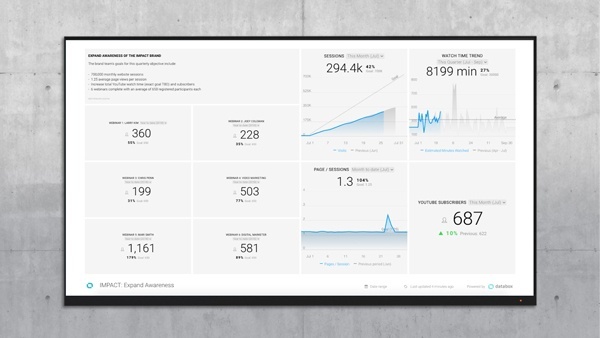 This dashboard includes basic metrics on total subscribers, top videos by watch time, and subscribers gained over time for each of our three channels. (Side note - it's pretty slick that you can include data from three separate YouTube channels in one dashboard!). I check this overview dashboard at least once a week to understand how our channels are progressing in terms of overall audience growth and to spot trends that might point to strong interest in particular content topics. For example, we recently created a video on “5 Leadership Books You Have to Read” for IMPACT’s main YouTube channel and, according to my dashboard, the growth in views is pretty strong week over week. What this tells me is we may want to create more content on leadership on some of our others channels such as the IMPACT blog (and when we do, we’ll definitely embed that video in the post!). Any time I see something out of the ordinary — whether it's a really positive metric like a sudden spike in new subscribers or a red flag like a drop in views on our videos — I like to dig deeper to determine the root cause. Download our Youtube Top Videos dashboard here for free. There is SO much good data available in these dashboards that I almost never need to visit YouTube itself to understand what is going on with our channels. Any marketer worth their salt is using Google Analytics to track website performance, so it should come as no surprise that I’m looking closely at Google Analytics data on a regular basis via Databox. For my team here at IMPACT, organic traffic is one of (if not THE) most important metrics we track. We get close to a half a million visits to our website a month and understanding what is driving (or not driving) that traffic is crucial to our ability to continue to grow it. For instance, I use a Google Analytics SEO Dashboard to track the website content that is performing best for us. It includes a list of our top organic landing pages, organic clicks by page and by search query (from Google Search Console), traffic from organic search, and organic landing page quality (basically, bounce rates and completion rates for people visiting our site via an organic search). 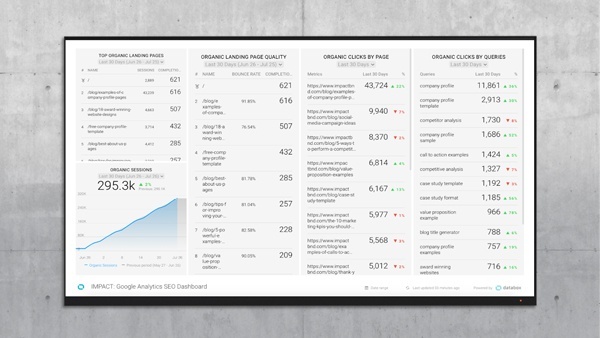 Download our Google Analytics SEO template here for free. One of the most valuable things about this dashboard is that it provides my team with the information we need to prioritize our CRO (conversion rate optimization) experiments. For example, this month we’re working on implementing a messenger bot on some of the pages that have a high volume of traffic but also a high bounce rate to see if, by recommending related content, we can keep visitors on our site longer. In addition to data around organic traffic, I use Google Analytics to understand the composition and behavior of our audience. 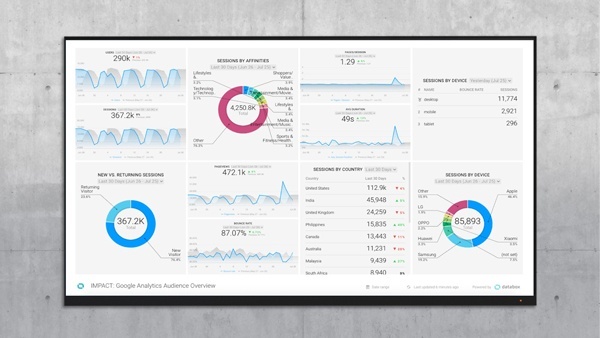 Download our Google Analytics Audience Dashboard template here for free from Databox. One of the things I watch very closely on this dashboard is trends relating to mobile versus desktop sessions. IMPACT is no different than most of the clients we serve in that the percentage of our overall traffic that is coming from mobile devices is on the rise. With mobile traffic increasing, we are paying particular attention to mobile ranking factors such as page load speed and using data on the specific mobile devices our visitors are using to ensure our site renders correctly on them. For example, from the data in my dashboard, I know that a full 50% of our mobile website visitors access the IMPACT website using an Apple device, so when we are building out new pages or considering updating our website’s layout or design, we always prioritize testing to see what they will look like on Apple iPhones. Because we track mobile versus desktop traffic so closely, I also have a dedicated dashboard for that in case I need more data to help explain shifts in usage trends or traffic growth. 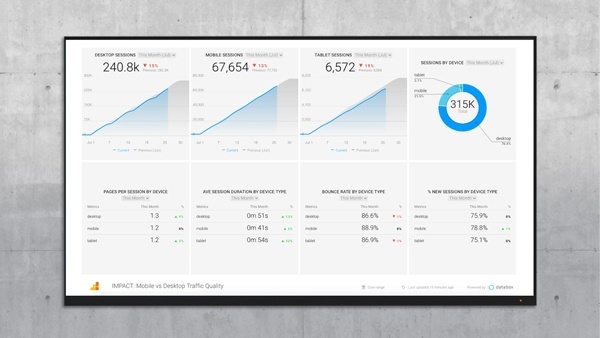 Download our Google Analytics Mobile vs Desktop vs Tablet Traffic Dashboard here for free from Databox. All of this data is tracked monthly and compared to our performance in the previous month. For a company that started as a digital marketing agency, IMPACT gets a LOT of traffic to its website. One of the reasons for this is that we’ve taken an aggressive approach to publishing content on our blog. Today, we publish between 14 and 21 blog articles per week, and I expect that number will continue to grow throughout the year. 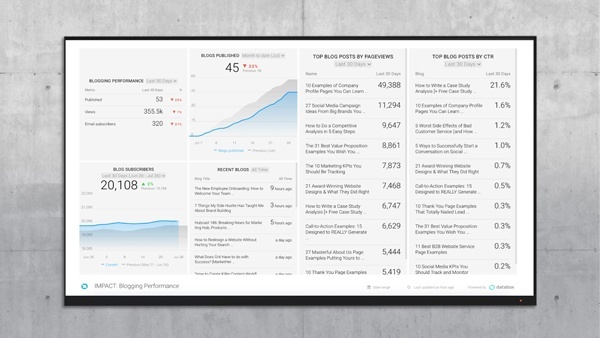 Download our HubSpot Blogging Performance Dashboard template for free from Databox. The blogs that get the most views are not necessarily the ones with the highest click-through rates, although there is some overlap. In fact, we’ve used this data to identify blogs that get a lot of views but that don’t get many click-throughs and have created offers specifically for these posts in order to capitalize on the traffic they are attracting. This is low-hanging fruit when it comes to optimizing our website for lead generation and a simple tactic that anyone can use. Although IMPACT gets a significant amount of organic website traffic and leads, we’re also big believers in the power of paid online advertising. In fact, we’re so committed to using pay-per-click ads in conjunction with inbound marketing that in the last 12 months, we’ve built out a dedicated team of PPC advertising experts that manages IMPACT’s campaigns as well as those of our clients. The bulk of our online advertising budget goes to Facebook ads, so I watch my Facebook Ad Performance dashboard closely to track performance and make sure that our spend doesn’t exceed our monthly budget. 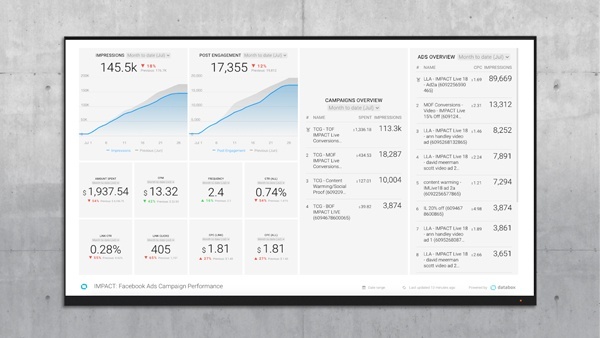 Grab our Facebook Ads Campaign Performance template from Databox for free. Because we are usually running several ads at once, I also like to be able to drill down into the performance of individual ads to spot opportunities to either amplify ads that are performing well or pause (and revamp) ads that are underperforming. I do the same thing with our LinkedIn ads. Download our LinkedinAds Overview Dashboard template for free from Databox. Much like my Facebook ad performance dashboard, my LinkedIn dashboard provides me with a high level overview of my ads’ performance as well as the ability to drill down into the details of individual ads. This year, IMPACT will hold our third annual marketing conference in Hartford, Connecticut on August 7 and 8. IMPACT Live is expected to draw 500 marketing and sales leaders to hear talks from thought leaders such as Ann Handley, David Meerman Scott, Dharmesh Shah, and Marcus Sheridan, as well as a host of other speakers. This is a big event for us and my team includes a full-time Director of Event Marketing whose primary job it is to ensure we hit our ticket sales goals. I track our progress on ticket sales (as well as event revenue) through a custom dashboard that pulls in data from Eventbrite. 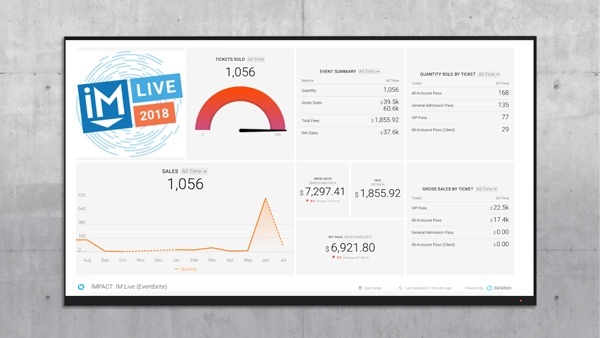 Download our Eventbrite Event Dashboard template for free from Databox. Because we have a large team of people in the company who work on IMPACT Live, this is one of the most viewed dashboards I have created. 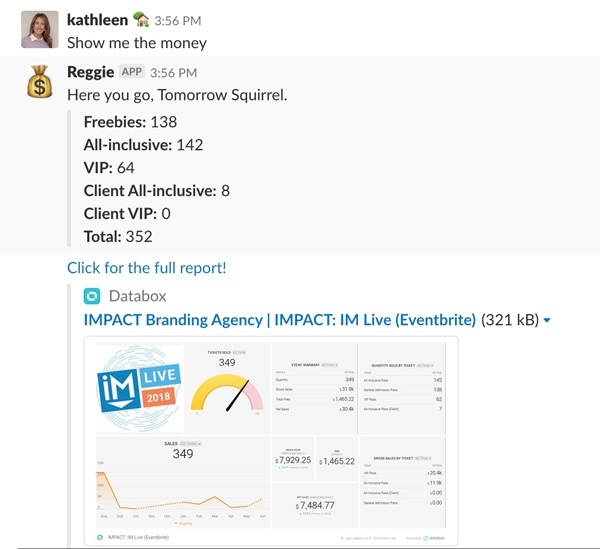 We actually have Databox integrated into a Slack channel so that anyone in the company can type “show me the money” and a Slack bot will instantly post an update on ticket sales with a link to the dashboard. Earlier this year, we implemented live chat on our website using Drift. Although it has been live on our site for a few months, we’re still learning and testing what works, so, I rely heavily on my Drift Overview dashboard to track our performance. Download our Drift Overview template from Databox for free. I watch this closely to see how Drift is impacting our new contact growth, but it also provides the sales team with a valuable snapshot of KPIs, such as average time to first response, that they need to meet under our sales and marketing service level agreement. It’s not an exaggeration to say that I couldn’t do my job without my Databox dashboards - they are that valuable to me, my team, and the people I report to. Here’s just a few of the benefits we realize because we have all of our data in one place. We stay focused on our goals -- Because we can see our progress to goal at anytime, we can keep everyone focused on them. We rarely get behind and when we do, we react quickly. We can connect our activities to outcomes in real time -- When an email performs well, the whole team knows about it. When a video performs poorly, we see that too. This transparency helps us celebrate the wins and motivates the team to adapt our plan so that we’re successful. We communicate better internally -- Our dashboards are accessible to anyone in the company and this eliminates the need for people like our COO, to whom I report, to constantly ask for updates on our key OKRs. How are you monitoring your team’s performance?